Malaysia Airlines flight MH370 disappeared because of suicide. Home Scandal and Gossip Malaysia Airlines flight MH370 disappeared because of suicide. Suicide is now being laid as the most likely outcome as to why Malaysia Airlines flight MH370 vanquished. The assertion comes after Malaysian military radar recorded the plane flying at an altitude between 43 000 to 45 000 feet shortly after its final communications with the ground. Flight MH370 Satellite images point to 122 new pieces. 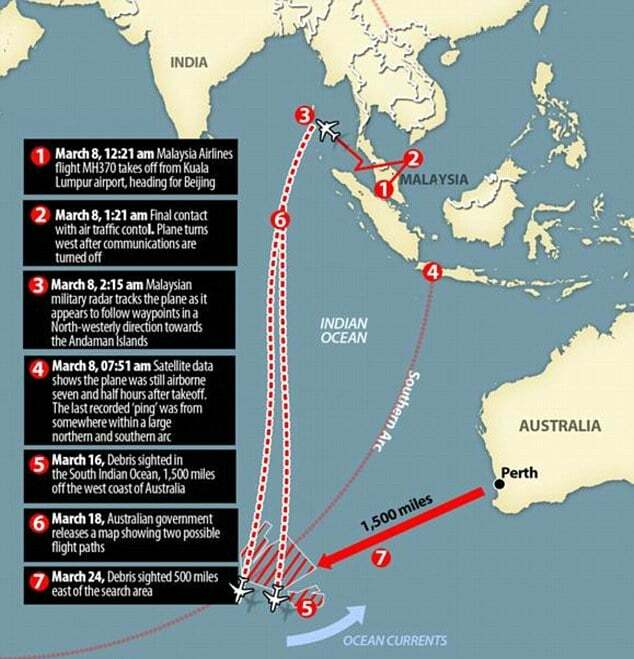 Flight MH370 confirmed to have ended in Indian Ocean but still no sightings. The source added that several other experts in the industry had come to the same conclusion. The 777-200ER Boeing aircraft used on the flight is known to have a maximum service ceiling of 43,000 feet and can very probably fly safely at even greater heights, one expert told. Nevertheless at that altitude it would take mere minutes if not seconds for hypoxia – a lack of oxygen – to set in if the cabin was manually depressurised by one of the pilots as air rapidly thins. Oxygen masks would have dropped down, but these only supply between five and 10 minutes of gas. The air used for pressurising the cabin comes through the engine and wing and is filtered before it enters the passenger environment. A pilot might need to turn off the pressurisation system if the aircraft enters dirty air, but investigators are looking at the possibility that it was disabled for sinister reasons on MH370. Scientists at British satellite firm Inmarsat used a wave phenomenon discovered in the nineteenth century to analyse the seven pings its satellite picked up from MH370 to determine its tragic final destination in the southern Indian Ocean. Britain’s Air Accidents Investigation Branch and experts from the European space industry were also involved in the analysis. Using this technique, Inmarsat was able to rule out that the aircraft had travelled in a northerly direction. 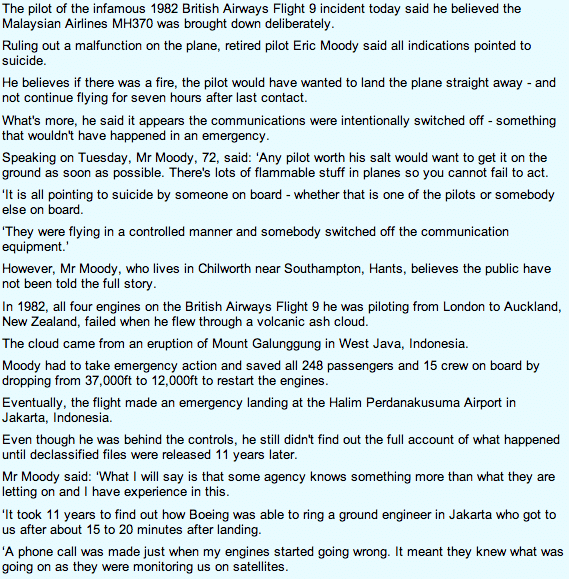 Yet not everyone is convinced it was a suicide mission that brought down Malaysia Airlines flight MH370. Chris Goodfellow, a Canadian pilot with 20 years experience believes that a fire broke out aboard the plane. He claims captain Zaharie Ahmad Shah was doing exactly what he needed to do in an emergency – and trying to get the plane to the nearest airport as soon as possible. Malaysian authorities have come under intense criticism for their handling of the ordeal, including claims they hid information and bungled the search. The clincher is the plane flying at 45000 ft FOR 23 MINUTES after communication ended. The pilot (who locked out the copilot) would have had 2 or 3 (or 4?) masks available to him in the cockpit. Shah flipped.